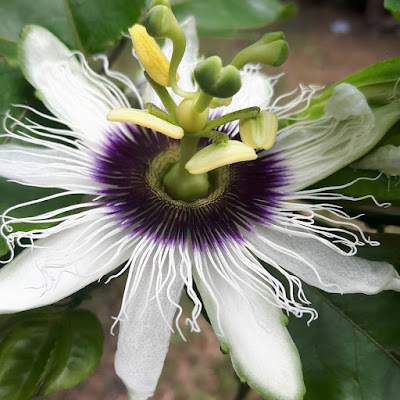 Coffs Harbour Garden Club: Passionfruit Vine is NOT very Passionate? Passionfruit vines are a bit like lemons - everyone who has a patch of garden 'out the back' would like to have them both growing. Imagery of these wondrous plants can often outstrip actuality - lemons seem to get every conceivable thing wrong with them including citrus canker, greasy spot fungus, sooty mold, phytophthora root rot, botrytis rot, anthracnose and citrus leaf minor, just to name a few AND not taking into account any deficiencies that may afflict them. Passionfruit vines can be problematic too - we dash off to the garden centre all 'fired up' to purchase a passionfruit thinking how that yummy fruit will sit atop the Christmas pavlova rather handsomely while boasting what a bountiful vine you have growing along your side fence. But alas, there is a problem....... the vine doesn't have any flowers - no flowers, no pollination, hence NO FRUIT. Age - some passion flowers don't always bloom right away - many species need several years to establish a good root system before they begin to set blooms. The flowers are resource hungry so the plant may have to build up resources before it will flower and then in turn, fruit. Fertilizer - passion flowers are fundamentally fairly rogue plants - not the fragile galloping plants we think they are. They don't need to be pampered and they certainly would prefer that you leave the nitrogen enriched fertilizer in the shed. Nitrogen will promote the most spectacular vegetative growth (usually spindly) and this is at the expense of flowers. All the plant's resources are forced into producing growth, not flowers. If you feel that this is your mistake, give your vine the addition of phosphorus (like bone meal) to correct the problem. Well rotted cow poo is great to use as a mulch around your passion vine too. Watering - passionfruit vines in my experience seem to thrive on neglect really and can handle drought conditions, however having said that though, they grow best when planted in a well-draining location and watered frequently. The soil should be moist, not wet. Even here on the Coffs Coast where we have lousy heavy soil our passionfruit is passionate and produces fruit for an extended period throughout the year. For a far more in depth article on growing passionfruit, please visit this article from GardenDrum's Jennifer Stackhouse.